Retractable pens feature a quick-drying, gel ink that dries three times faster to keep your writing clean and consistent without smudges. Smooth-flowing ink lays down effortlessly without any drag for a more enjoyable writing experience from your first word to your last. Ergonomic comfort grip wraps around the color-tinted body to help minimize hand fatigue during extended periods of writing. Plus, a handy clip attaches to pockets, notebooks and more for easy access and storage. 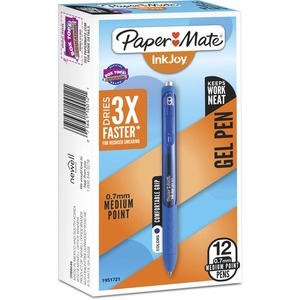 Gel pens with blue ink are perfect for everyday use at home, office and school.